News from the stores: Mirror, Mirror on the Wall….. This morning, as like every other, the last thing I did was to check my appearance in the mirror before I left the house to brave the world, and that is when it all started. When and how did mirrors begin? They must have been invented by someone, somewhere surely? A quick look at various websites came up with a wealth of information about mirrors from around the world, through the past, modern day scientific types and even some scary futuristic uses of mirrors! It turns out that simple mirrors made from pieces of polished stone such as obsidian and volcanic glass have been unearthed in Central and South America dated to 2000 BC. 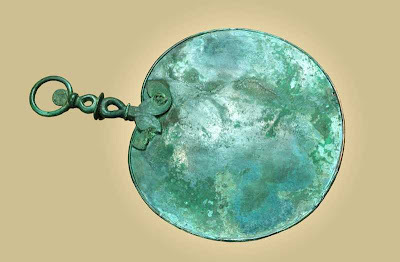 More sophisticated mirrors, manufactured from sheets of polished copper, have been found from at a number places around the world including Mesopotamia from 4000 BC, in ancient Egypt from 3000 BC and from China around 2000 BC. The oldest mirrors in our collections found in Bedfordshire, dated 400 BC to AD 100, and are mere babies compared to those from the ancient world! 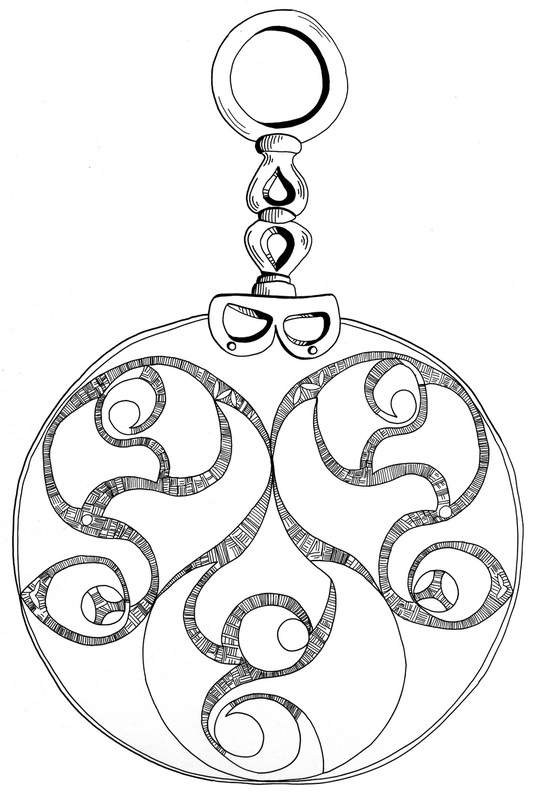 Celtic Art design engraved on the back of the mirror plate. Left: Old Warden Mirror. Right: Bromham mirror. Making a bronze mirror would have called upon specialised skills. The first step would be to extract and smelt copper and tin from the natural ore, these metals would then be merged to produce bronze. The handle would then be formed from bees wax and covered in clay to form a mould. This would then be heated to allow the melted wax to be poured off and to be replaced with molten bronze. Once this was cooled the bronze handle would be broken out of the clay mould. Detail of engraved pattern on the Old Warden mirror. The plate would either be made from cast bronze or a sheet of bronze which would then be painstakingly hammered and formed to the required shape, size and thickness. 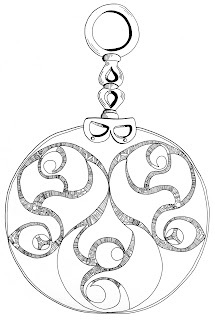 The backside of the mirror would then be decorated with engraved interlaced swirling, patterns and the front ground and polished to produce the reflective surface. Finally the handle would be riveted to the mirror plate. A typical mirror of this type is about 350 to 400 mm long and the round or kidney shaped plate is about 200-300 mm in diameter and is 1 to 2 mm thick. Serious archaeological, academic research into this restricted group of functional yet highly decorated objects has concluded that they represent so much more than merely a way of checking personal appearance. The polished side of the mirror, now tarnished. ﻿ The very rarity of these objects combined with the sublime skill and craftsmanship need to produce them would ensure that only the wealthiest and most powerful individuals in a community would be able to own them. As many of these mirrors were found during the Victorian period the exact location of where they were excavated is not known. Those with known provenance seem to be associated either with ritual deposition in watery contexts such as lakes and rivers or in burials as grave goods to accompany an individual into the next life. The association of mirrors with either a group ritual at a waterside shrine or as a treasured procession for an individual reinforces their high almost magical status. Mirror ownership as a symbol of power seems to be even more powerful when you actually consider the properties a mirror has. Its reflective qualities allowed the user to see not only their own face but if positioned correctly the user could clearly see behind. This “third eye” effect could be of great practical benefit to the user as well as making them appear to be all knowing. Yet more magical power stemming from the mirror surface is unleashed when the owner turns the reflective surface around to face the sunlight or moonlight. Now the mirror surface acts as a miniature version of either the sun or the moon and the captured rays could then be made to dazzle on lookers. The appearance that the mirror and its owner were able to command rays of light and use them to induce blindness would have been a powerful weapon to control and instil fear into a community. 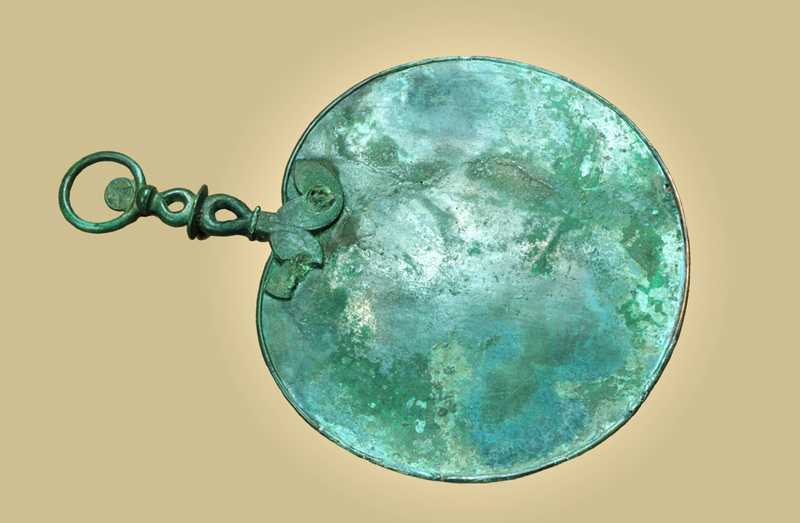 As an archaeologist I have long realised that late Iron Age mirrors are extremely rare and Bedfordshire is rather fortunate to several complete examples I had not really appreciated the symbolism and power associated with them, until today.